In addition to the battery, there are two other major components to your vehicle's starting and charging system. And these two components must be in good working order for your vehicle to start and run properly. The alternator is vital to ensure all other electrical components work. 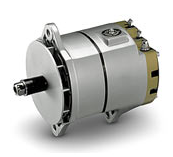 The alternator generates direct current for recharging the battery and for powering the vehicle’s electrical loads. With every oil change you should have the alternator’s drive belt tension checked. 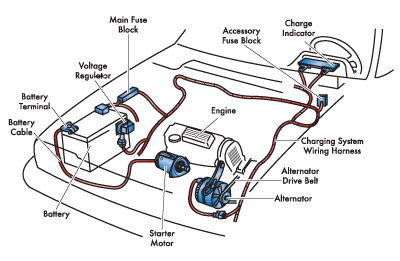 A loose belt can reduce alternator output and decrease the vehicle’s battery’s life. You should have the alternator tested once every summer (or at least once a year) to determine if it is producing the proper amount of current and voltage. A faulty alternator can cause your vehicle’s battery to drain prematurely, burn out light bulbs, erratic engine operation and repeat voltage regulator failures. When you turn the ignition key, you are actually turning on the starter, which then cranks the engine. When a starter isn’t working correctly, the engine may start with great difficulty, or not at all. Starter problems may be due to electrical/mechanical failure or outright breakage. Often times a malfunctioning spark plug can have the characteristics that would lead you to believe something may be wrong with your starter. Don’t worry though, at Midas we repair and replace starters, as well as other electrical components. At Midas, we have technicians that are specifically trained and certified in automotive electronics so we can quickly asses an electrical problem and determine if the culprit is the battery, starter, alternator, or something else.